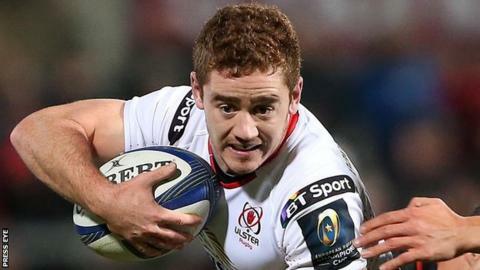 Fly-half Paddy Jackson will lead Ulster for the first time in Sunday's crucial Pro12 match against the Scarlets. The 24-year-old has been disappointed at not being involved in Ireland's Six Nations campaign, but his availability is a boost to table-toppers Ulster. Welsh squad player Aled Davies starts at scrum-half for the Scarlets after being released by Warren Gatland and he partners Aled Thomas at halfback. Thomas replaces injured Steve Shingler as two of the Pro12's top four meet. Fourth-placed Scarlets, just a point behind Ulster in third, drop Rhodri Williams to the bench to accommodate uncapped Welshman Davies. Ulster pair Ruan Pienaar and Ian Humphreys, who had to go through 'return to play' protocols following concussion, are on the replacements' bench. Rory Best, Jared Payne and Andrew Trimble are not available to Ulster as they are on international duty..
Scarlets beat Edinburgh 22-21 and Ulster triumphed 13-10 over Glasgow last Friday. The west Wales region have not won away in the Pro12 since beating Treviso in December, 2015. Meanwhile Ulster have secured centre Stuart Olding until the end of the 2018-19 season and prop Rhodri Jones is to depart Scarlets for Ospreys at the end of the current campaign. Ulster: S Olding, C Gilroy, D Cave, L Marshall, J Stockdale, P Jackson (capt), P Marshall; A Warwick, J Andrew, R Lutton, A O'Connor, F van der Merwe, R Diack, C Henry, R Wilson. Replacements: J Murphy, K McCall, B Ross, P Browne, C Ross, R Pienaar, I Humphreys, S Arnold. Scarlets: M Collins, G Owen, R King, H Parkes (capt), DTH van der Merwe, A Thomas, A Davies, P John, K Myhill, P Edwards, G Earle, D Bulbring, A Shingler, W Boyde, M Allen. Replacements: R Elias, D Evans, R Jones, M Paulino, R Pitman, R Williams, D Jones, S Evans.